24 - 26 Sep 2018 Jewel Coffee: Get 1-for-1 Coffee from 3pm Onwards! Have you had your coffee yet? 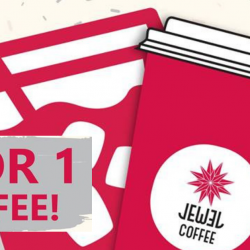 Grab your afternoon coffee fix with a friend at Jewel Coffee today and enjoy 1-FOR-1 coffee! Valid from 24 - 26 September, 3pm onwards! 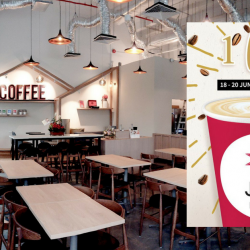 16 - 18 Jul 2018 Jewel Coffee: Buy 1 Get 1 FREE Drink from 3pm Onwards! FIFA World Cup fever got to you? Jewel Coffee got the perfect perk-me-up if you need a caffeine boost! Kick off your week with 1-for-1 drinks after the world cup finals, from 16 - 18 July, 3pm till closing. 18 - 20 Jun 2018 Jewel Coffee: Enjoy 1-for-1 Drinks from 3pm till Closing! 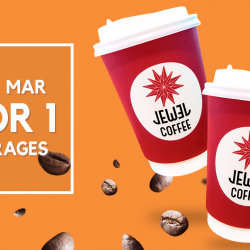 Mark your calendars now because Jewel Coffee's 1-for-1 Drinks is here again from 18 - 20 June, 3pm till closing! 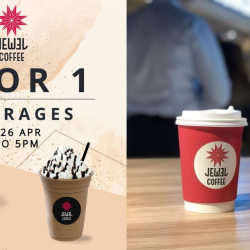 Till 21 Mar 2018 Jewel Coffee: Enjoy 1-for-1 Drink from 3pm Onwards! 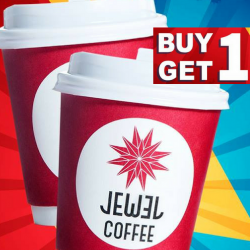 Treat yourself and a friend to 1-for-1 drinks at all Jewel Coffee outlets from 19 - 21 March, 3pm till closing. Mark your calendars now!